Oil-and-gas sector expresses doubt over Democratic Gov. 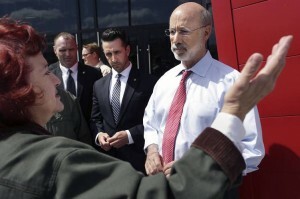 Tom Wolf’s support for booming industry. Since taking over from a Republican administration this year, Democratic Pennsylvania Gov. 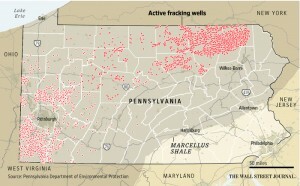 Tom Wolf repeatedly has said he supports the state’s booming shale gas industry. But lately, the industry is questioning his commitment. State regulators, who have begun reviewing dozens of environmental cases the previous administration handled, recently imposed an $8.9 million fine for a gas well they said is contaminating drinking water—the largest ever against a gas operator in state history. The state is also proposing a raft of stricter drilling rules to prevent waste water from contaminating drinking water sources. And industry officials are upset that the Wolf administration earlier this month slashed its estimate of state jobs supported by the shale-gas industry to 89,000 from the previous administration’s estimate of more than 200,000. “This administration’s words continue to be alarmingly detached from its actions as it relates to policy and regulatory matters,” said Dave Spigelmyer, president of the Pittsburgh-based Marcellus Shale Coalition. Jeffrey Sheridan, a spokesman for Mr. Wolf, said the administration seeks a balance between promoting development and protecting the environment. Mr. Wolf took office in January after defeating former Gov. Tom Corbett. Mr. Sheridan said the prior administration’s industry jobs figures were inflated, including road-construction workers, truck drivers not employed in the industry, and even state regulators. Mr. Spigelmyer said the change appeared motivated more by politics than economics. Another sore point for the industry is the governor’s appointment of cabinet members who previously worked for an environmental nonprofit organization called PennFuture. Republican House Speaker Mike Turzai said he opposes the severance tax and believes the governor’s revenue estimate is too high. “The governor’s proposal will amount to a de facto moratorium on the development of natural gas in the Commonwealth,” he said.